When using GD&T axis straightness along with an orientation or position tolerance, can the specified straightness tolerance value be greater then the specified orientation or position tolerance values? If not, then why not? Is it proper to specify (show) a basic dimension on a drawing without a corresponding tolerance in a feature control frame? If so, in what situations would it proper? The correct answer to the question is…No! When used alone with a size dimension, axis straightness does allow the feature to go outside the MMC boundary envelope. However, according to the Y14.5M standard, “Where the straightness tolerance is used in conjunction with an orientation or position tolerance, the specified straightness tolerance value shall not be greater that the specified orientation or position tolerance values.” (Para. 6.4.1.1.2, pg 158). This makes sense; there is no way an axis may fit within an orientation or position cylindrical tolerance zone if the axis is “bent” more than the allowed orientation or position tolerance value. Congratulations if you answered the Test Your GD&T Knowledge question correctly! The correct answer to the question is…Yes! There are two situations where a basic dimension can be specified without a corresponding feature control frame. 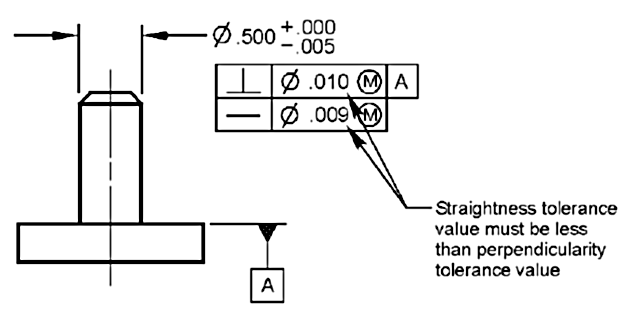 A basic angle may be specified on an angled surface as shown in Figure 4, where a size dimension controls the size of the tolerance zone. (See ASME Y14.5M-1994, 2.12). Basic dimensions may also be used when specifying the location of datum targets as shown in Figure 5. The tolerance for the location of the datum targets is determined by “Gagemakers Tolerance” or “Toolmakers Tolerance” (established tooling tolerances). (See ASME Y14.5M-1994, 4.6.2).